3herosoft Movie DVD Cloner is fast movie DVD Cloner software which helps you clone your D9 and D5 movie DVD collection to blank DVD discs (D9 to D9 and D5 to D5) with ease. It supports DVD 1:1 clone with a DVD burner, you can easily get your DVD cloner which remain 100% same to the original DVD movie Discs. Moreover, it can compress DVD-9 (dual-layer DVD) to one DVD-5 disc. Movie DVD Cloner also allows you to remove movie DVD menus, select subtitles and audio tracks, or clone main movie separately to create customized DVD.Even 3herosoft Movie DVD Cloner can clone movie DVD with any region code. It is significant for you to personalize and backup your precious DVD movies without fear of damage or loss. Perfectly clone DVD-9 to DVD-9, DVD-5 to DVD-5 in 1:1 ratio with all menus, extras, subtitles, and audio tracks. Copy DVD movie from a dual-layer disc to a DVD-R, the movie DVD cloner can easily compress DVD-9 movie to DVD-5 with excellent image quality. With Movie DVD Cloner software, you can select DVD folder or ISO file as source, and perfectly clone ISO file or DVD folder to DVD disc. Clone DVD whole disc with all the special features, intros, trailer and ads, or copy main movie only with extras and special features omitted. Clone movie DVD to any disc including dual-layer DVD with any DVD+RW/-RW burner to play on all DVD players. Optionally remove extra menu while clone movie DVD to ensure the best DVD quality and easily clone DVD for playing target main DVD disc directly with menu skipped. This Movie DVD Cloner software lets you copy movie DVD entirely to DVD+R/RW, DVD-R/RW, DVD-RAM and dual layer 8.5GB disc. Breezily erase your rewritable DVD disc content for rewriting new DVD movies, you can clone new DVD folder or ISO file to this rewritable disc. 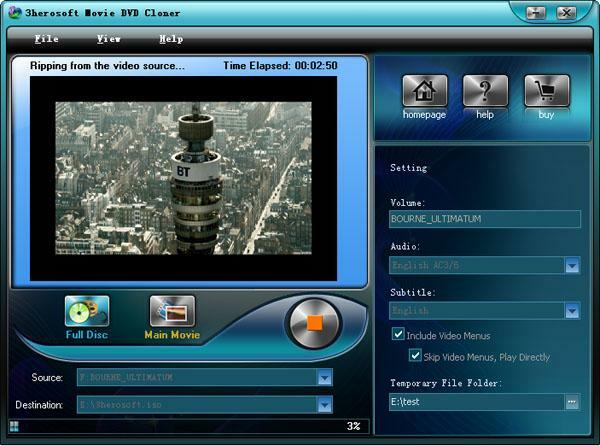 Allows to remove DVD menus, select subtitles and audio tracks, or only copy main movie to create customized DVD. How to copy movie DVD to a blank DVD disc? How to back up DVD disc to ISO or DVD Folder on your computer?